That pretty much describes how the title business works. Not only is it tedious as the dictionary suggests, but this simple statement also lies at the heart of what is very wrong with the title business. The wheels of our business are oiled by referrals. We live by the orders we receive; and we don’t get orders from the consumers who pay for them. Consumers do not buy title insurance often enough to do any research, weigh the differences in providers, or compare services and prices. Someone else (of course, a trusted advisor) recommends the title/settlement provider and makes the referral. As such, the market responds to this reality by focusing on the referrers. In fact, we reward the referrers to encourage them to continue the stream of orders. How is this so? Well, underwriters may offer agents extraordinary splits to encourage them to write policies for them. Referrers and industry members may partner with each other and set up affiliated entities to enable the flow of rewards for the referrals. Service fees and “processing costs” paid by the unsuspecting consumer may be shared with referrers. Lavish entertainment, all-expense-paid trips, and free tickets to popular sporting events may be used to reward past referrals and entice continued orders. Lawmakers recognized these temptations in the real estate marketplace more than 40 years ago when the Real Estate Settlement and Procedures Act (RESPA) was conceived. Nonetheless, rewards to referrers continue broadly unchecked in much of Illinois and certainly in the Chicago market. Markets cannot operate properly when they become severely hampered by systemic dysfunction. Our ‘old chestnut’ describes in plain terms where the dysfunction lies and begs for the solution. The solution can lie only in reasonable, intelligent, and impartial regulation. Peggy Noonan is always perfectly balanced. We can hope for smart regulation, But, that will surely take time. Till then, we must continue the tough conversations and exercise regular industry self-examination. 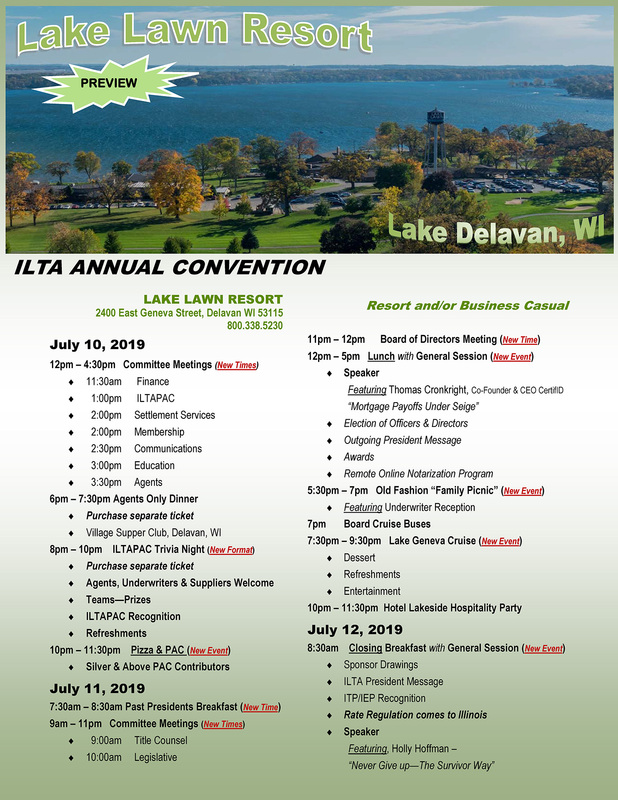 A good start may be adding ILTA programs to members and non-members on good business practices and ethical market conduct. It may be a moment of déjà vu, but I seem to remember talking about the advantages of cleaning up our practices within the industry rather than having the solution imposed on us from outside. Are you having that same feeling of déjà vu? I look forward to the day when that ‘old chestnut’ will be just a quaint old joke and not the description of a market that is badly out of whack.